A lot has happened at HP over the past decade. With all that was going on at the company, where do you think you've fallen behind? And on the flip side, where are you ahead of the competition? It's hard for me to comment about where we missed the initiative prior to when I got here, and I didn't spend a lot of time trying to figure it out, because you can't change the past but you can change the future. So I wanted to make sure that particularly on the data center infrastructure side that we were best in class. We refreshed our entire server portfolio from top to bottom, whether it's rack or tower or the Gen9 ProLiant server. We've invested heavily, as I mentioned, in high-performance compute. We've got a refresh of our Superdome servers, we call them Superdome X and Superdome Integrity X servers. And we have very much focused on HP OneView, which is the system software that actually knits together many of our most important products. If you think about converged [computing], I would say converged was in many respects our idea, and I think we didn't execute as well on converged as we should have. But you look at our new converged offering, HPE Synergy, and I think we have now caught up with and perhaps surpassed the competition. We're really excited about Hewlett-Packard Enterprise Synergy, which I'm sure you know is basically our Composable Infrastructure. Another two-sides-of-the-coin question. What do you see as the biggest challenge for the new HP Enterprise right now, and what do you see as the biggest opportunity? I'd say the biggest challenge is this market continues to move at lightning speed. There's a new competitor every day in some element of our business, and it's not usually the big guys. It's a Silicon Valley startup. We have to make sure that we are leading the market, not following the market. But if we need to follow, we need to follow fast, and then add that HP magic to our infrastructure products. We're very pleased with our Helion Cloud that is getting real traction in the marketplace, over 200 new customers in Q1. Version 2.0 of Helion OpenStack is fabulous. In fact, I was just talking to our own internal IT team yesterday, who was super-excited about the next generation of Helion OpenStack. So it is a brutally competitive market. I have to say this is far more competitive than my background at eBay. Everyone thinks that the consumer Internet space is competitive. This is a whole new dimension, and I think it's only getting more competitive as the underlying technology is changing. So that's, I think, the biggest challenge -- speed and agility. 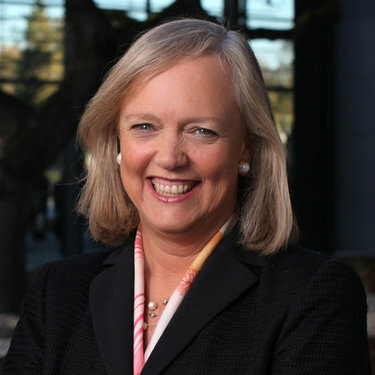 And the biggest opportunity is we have a very well-capitalized company in Hewlett-Packard Enterprise. It is smaller, more nimble. I will put up our engineers against anyone in the industry for enterprise-grade technology. We've got a real opportunity to redefine Hewlett-Packard Enterprise for the next generation of enterprise infrastructure software and services. What perception about HP would you most like to change now? I think we've done a good job of changing the perception, but I still get asked questions. When I was in Davos, I did an interview and the fellow had actually not moved beyond a decade ago. I mean he was asking me about board drama, turnover of CEOs. I mean the old stories about HP, which by the way were not inaccurate, you know, five or 10 years ago. We've actually had stability now for nearly five years. I think we've done a great job of revamping our go-to-market. The board is the best board, I have to say. We ended up fixing the board at HP before the split and then the split gave us an opportunity to get world-class board members. If you haven't looked at the board members for Inc. and for Enterprise, you should. I think both boards are the best boards in corporate America. Diverse, incredible skill sets that are relevant to the business and real team-oriented boards. So I think I'd probably love to make sure that people have moved beyond the chatter about HP five or 10 years ago. In many interviews or stories about you, people will talk about the layoffs, the number of layoffs. What's the flip side of that; where are you hiring today? What customer-facing functions are being bolstered in particular? In the last couple of years most of our reductions in force have been in Enterprise Services in complex European countries, which needed to happen. But as you know, it's very challenging to do that, so a lot of CEOs just don't. But we had to get the cost structure right for Enterprise Services. So a lot of engineering talent is being hired in offshore locations in SAP HANA, for example, our center of excellence for SAP HANA, for which we are I think among the best in the world. It's in the Philippines, in Manila. I mean if you ever have a chance to go to Manila and see our SAP HANA center of excellence, it's stunning. Big installations in Bangalore, Chennai [India], Sofia, Bulgaria, Costa Rica. So we're hiring a lot of very talented executives in these locations. And you may say they're not customer facing. Actually they are customer facing in many ways because they're doing a lot of the work that the customers count on. We've invested in our go-to-market coverage model. A lot of the criticism of HP was we kept changing the people who were in front of customers, our AGMs or our AEs [account executives], which were the lead for both our services business and our infrastructure business. There's been a lot more stability now at the customers. We're doing a better job of covering the big companies. I remember when I went to the Research Board four years ago, three-quarters of the Research Board CIOs were like: "We haven't seen anyone from HP in three years." That has changed. When you talk about improving go-to-market, what changes specifically for the customer? So go-to-market is another word for sales effectiveness, and presales and the technology assistance that a customer gets. We have stability at these big customers, not everywhere, but most places. We also now have a CTO assigned to our biggest customers that can help them think through the underlying architecture that they want to deploy in their environments, whether it's on-prem as I said before or in a virtual or managed private cloud. What is the architectural roadmap that they want to deploy as they try to reduce costs and improve their ability to service business needs? And then our presales organization, we have beefed that up as well. That is the arms and legs to can do a lot of the spadework with the CTO to help customers figure out what they'd like to do next. Are there areas of hiring that you wanted to identify? As I said, RD, engineering. We have been increasing our hiring, particularly in our engineering functions. Anything that is RD-oriented and sales-oriented, we tend to invest in and we've tried to reduce and be more efficient in the non-customer facing functions -- HR, finance, legal. Although we have made a substantial investment in our own internal IT. This was one of those funny situations where the cobbler's kids have no shoes. We had quite some work to do in investing in our own IT so we could be easier for customers and partners to do business with. I agree with you that this is a very exciting time in IT because the next-generation architecture is taking shape, although I'm not sure everyone is entirely clear what that will look like. Why is HP Enterprise a better partner going forward for customers than a Dell/EMC or a Cisco or anyone else? As you well know, we obviously have a fantastic footprint across the globe. We can help customers implement anyplace, anytime. We talk about TS as a big important part of that, but first of all we can do anything anywhere. You want to set up, reinvent your edge IT system on an oil rig in the North Sea, we're there. You want to do it in Kazakhstan, we are there. There are only a handful of customers now that can do that effectively globally with their own people. So that's the first thing. Remember I talked to you about our innovation engine and how we are really focused on innovation at the company? It's interesting because Dell/EMC, they have taken an entirely different strategy than we have. We decided to get smaller, they decided to get bigger. We decided to de-lever the company. We've got about $10.5 billion of cash on the operating company at Hewlett-Packard Enterprise. They have chosen to lever up. We have chosen to lean into new technology, like 3PAR all flash [storage], our next generation of servers, high-performance compute, hyper-converged Composable Infrastructure and our Helion OpenStack cloud offerings. I think they are about to double down on old technology and run a cost takeout play. The way you should think about it, in my view, is Dell/EMC is now owned by private equity. What does private equity do? They rip out cost. And some of that cost is probably good to rip out and some of it is going to cut into, I'm certain, their innovation engine. Two entirely different strategies. As one of my investors said the other day: "One of you will be right." Clearly, there'll be a period of transition as those companies go through a lot of changes if that deal goes through. But why do you think they're banking on the old? What indication do you have of that? Well, think about what's going to happen here. They are doing a private equity play. When you get bigger, when the market consolidates, what are you actually trying to do? You're trying to rip out cost and you're trying to rip out duplicate cost as well as cost costs. Just think about the RD spend there. The cost of the Dell/EMC debt is going to be much higher than they had originally thought because the debt markets have moved. It'll be probably in the $US2.7 to $US5 billion annual range. The entire budget for RD at EMC is $US2.7 billion. So there's going to be some impact in my view on RD. And then there's going to be, to your point, a lot of figuring out who's on first at what customers, go-to-market rationalization. Talk about losing your favorite sales rep. By definition, half the people are going to lose their favorite sales rep. I think from a financial architecture perspective, this could be quite powerful in the long run, but I think it's going to be a challenge. We've got to stay focused on innovation, on customer needs, on presales, on architects, on these four transformation areas, while Dell/EMC is restructuring themselves. I think there's at least a two- to three-year opportunity where we have a chance to really show our world-class innovation and the ability to help customers migrate to a better place for them.